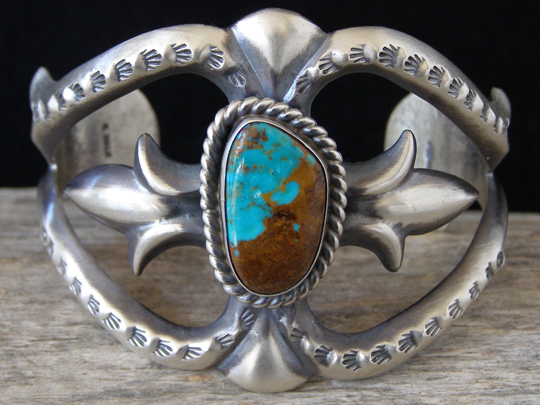 Eugene Hale Kingman Turquoise Sandcast Bracelet size 6 1/8"
This sandcast bracelet by Eugene Hale is set with a free-form stone of natural, untreated Kingman turquoise marked by rich brown matrix. The stone is set in a smooth bezel and wrapped by twist wire. After removing his bracelet from the sandcast mold (and before bending it to fit a wrist), he decorated the bracelet with stampwork. This is made for a relatively small wrist. Hallmarked E. HALE and stamped Sterling inside. Width in front at stone: 2"